New Videos will be Coming Soon. Tired of seeing the same old outdoor shows with the same host hunting the same ranch or fishing the same pond or lake for one species of fish? Well if you’re looking for the ultimate Outdoor Adventure, one featuring real outdoorsmen and women who spend thousands of hours in the outdoors hunting different game and fishing all species throughout the United States and Canada, then Outdoorsmen Adventures is what you’re looking for. Unlike some shows where the host stands or sits in front of their trophy wall or in a sponsor’s vehicle, spending the majority of the show talking about hunting and fishing, on Outdoorsmen Adventures you’re not going to see a whole lot of of the indoors or standing around and talking, you’re going to see hunting, fishing and the outdoors as it really is. Outdoorsmen Adventures is an award-winning weekly outdoor program beginning its 24th season in 2019. It can be seen on 62 markets each week through out the upper Midwest as well as on live Internet at www.MyOutdoorTV.com. Hosts Gary Howey and Larry Myhre are former hunting and fishing guides, full-time outdoor communicators, Active members of the Association of Great Lakes Outdoor Writers Association (AGLOW) and have both inducted into the National Freshwater Fishing Hall of Fame. They and Team Outdoorsmen Adventures members will take you along as they go to some of the hottest hunting and fishing locations throughout the Midwest and Canada. Hosts Josh Anderson and Mitchell Sudbeck are avid outdoorsmen and will be the main hosts starting in July of 2018. They are big in creating habitat and foodplots as well as hunting archery turkey, deer, antelope and upland game. Fishing: Join our Team as they probe the depths of the lakes in South Dakota’s, Nebraska, Minnesota, Iowa, Manitoba and Ontario as well as the Missouri River and its reservoirs, Lake Oahe, Lake Sharpe, Lake Francis Case and Lewis & Clark Lake for walleye, sauger, bass paddlefish and catfish. You’ll also find them fishing on both the open water and hard water seasons for walleye and perch on the Glacial lakes of South Dakota, North Dakota’s Devils Lake, Minnesota’s Mille Lacs and Lake of the Woods. Larry Myhre and Gary Howey will still handle the fishing shows with our Team members showing you what to bait up with and how to locate and catch monster perch, walleyes, catfish and bass. Outdoorsmen Adventures, will teach you how to rig up and what to use to catch fish and the types of tactics it takes to land that trophy fish. The methods they use will include jigs, live-bait rigs, trolling lead core line, planer boards, downriggers and slip bobbers. The things you’ll see and learn on Outdoorsmen Adventures will help you to become a better angler no matter what season, species of fish you’re after or body of water you’re on. Team Outdoorsmen Adventures members are some of the most successful outdoorsmen and women in the upper Midwest and they’ll show you what it takes and how to catch the fish. On the show, you’ll learn how to fish lakes, reservoirs and rivers as well as the methods used to catch fish calling these bodies of water home throughout the year. Hunting: On Outdoorsmen Adventures , we aren’t just about fishing as we cover all of the outdoors, with hunting being a big part of our outdoor experiences. On Outdoorsmen Adventures, hunting is not a competition, it’s our way of life. Join us as we hunt Upland Game, Waterfowl and Big Game, pursuing pheasants, ducks- geese, turkey, bear, deer, antelope and predators as we film in some of the finest hunting areas in the Midwest. We’ll be going after pheasant, turkey, waterfowl, bear, deer, predator and antelope in Nebraska, South Dakota, North Dakota, Iowa, Kansas, Minnesota and Manitoba. We’ll also do some bow fishing after Paddlefish, Bighead Carp , Silver (Flying) Carp, Buffalo and Grass Carp along the Missouri River that forms the border between South Dakota and Nebraska. No matter what you hunt for or how you hunt, we’ll have something for you, we’ll be in the field and on the water with shotgun, rifle, muzzle-loader and bow. On Outdoorsmen Adventures, you’re going to learn what it takes to make your next hunting and fishing trip successful. We want to teach you the methods that will make your next trip on the water or in the field a great one. Support Our Troops: Outdoorsmen Adventures wants to remind you to support the brave men and women that are currently in the service and those who have served to defend our country our way of life. The people of the armed forces are very important to us and our host, as Gary a disabled vet spent many years in the regular Army serving in Germany and Viet Nam as well as in the Iowa and Nebraska National Guard. He knows all the sacrifices they and their families are making in order to defend our freedom and that of our country. They need our support and that of the entire country. Politics shouldn’t be brought into the equation when it comes to supporting our troops! No matter what party you belong to, drop the politics and support them as Americans. Outdoorsmen Adventures has several shows planned with veterans, including those with the Paralyzed Veteran’s Of America and Wounded Warrior Guide Service. We at Outdoorsmen Productions, will do all we can to let the men and women of the armed forces know we appreciate all they’ve done for us and our country. Hunting, Fishing and a Whole Lot More: On the show, you won’t see us standing in front of a trophy wall or leaning up against an ATV or truck telling you how great our trip was, because we know you want to see things that are going on in the outdoors. The majority of our Outdoorsmen Adventures viewers would rather see hunting, fishing and the outdoors, not us talking about what happened.. On Outdoorsmen Adventures, we give you less talk and a whole lot of hunting and fishing. 2016 *2016-AGLOW Awards in Craft Best of Newspaper, 2nd place in the Fishing category for Gary’s “Of the Outdoors” column “Catfish are Eager Biter” * 2016-AGLOW Awards Best in Craft TV-Video Fishing category, Outdoorsmen Adventures television received a 1st for the “West River Bluegill” segment and a 3rd for the “Carroll Lake Ontario Walleye” segment, both in the Best of Television category. *2016-AGLOW Best of Television-Open category Outdoorsmen Adventures was awarded 2nd for their “Aberdeen Wounded Warrior Pheasant hunt” , the series received a 3rd Place for their “Doug Brown Pheasant Hunt” segment both in the Best of Television-Hunting category. *2016-AGLOW in the Best of Radio-Open “Outdoor Adventures” radio received 1st place for “Habitat Acres & Pheasant Numbers on the Rise and a 2nd place for their “Remembering Terry Redlin” show. * 2016 AGLOW in the Best of Radio-Fishing, In the best of Radio Fishing category, Outdoor Adventures” was awarded 1st place for their “There’s something in the Air” shows and 2nd for their “Kids and Fishing” show. 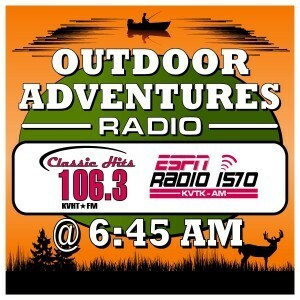 If you’re looking for a “no bull” outdoor show with less talk and a lot more hunting and fishing, then Outdoorsmen Adventures is right up your alley! It’s real outdoorsmen and women hunting and fishing in the real outdoors, that’s what Gary Howey’s Outdoorsmen Adventures television series is all about! Come along, you’ll be glad you did!